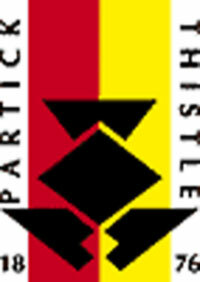 Partick Thistle Football Club (the Jags) was formed in Partick in 1876 and moved to the present stadium in Firhill in 1909. The club won the Scottish Cup in 1921, winning 1-0 in the final against Glasgow Rangers. The club's other major achievement was a memorable 4-1 win in the final of the Scottish League Cup against Glasgow Celtic in 1971. Despite these major wins and their long tradition, Partick Thistle have never won the Scottish football league, and in recent years they have declined as a footballing power. So much so, in fact, that in 1998 Partick Thistle nearly went backrupt - saved only by a "Save the Jags" campgaign by their fans. Partick Thistle are the only team to have been relegated twice in back-to-back seasons, in 2004 and then again in 2005. Partick Thistle Football Club is located in Firhill, close to Maryhill Road.